Here’s a first look at the latest Ride of the Week: the 2014 Chevrolet Cruze Diesel. A small badge that reads “2.0TD” is mounted on the decklid of this compact Chevy sedan. It’s the only indication that this Cruze runs on Europe’s favorite fuel. To the casual observer, the diesel-powered version is identical to it’s gasoline counterpart. Drivers, however, will notice three significant differences: fuel efficiency, price and driving dynamics. The fuel economy advantage of the 2.0-liter turbo diesel compared to the 1.8-liter base gasoline engine is significant, especially on the highway. The Cruze Diesel is rated at 46 mpg highway, nearly a third better than the 35-mpg highway gas car. City economy for the diesel is rated at 27 mpg. The base price for the diesel, though, is significantly higher than the lowest price for gas-powered Cruze with an automatic transmission: $25,695 for the diesel versus $19,180 for the gasser. The comparison is unfair, though. In terms of equipment, the base Cruze Diesel lines up with the mid-range gas-powered Cruze 2LT. It starts at $23,305, so the real price premium to upgrade to the diesel engine is about $2,400. 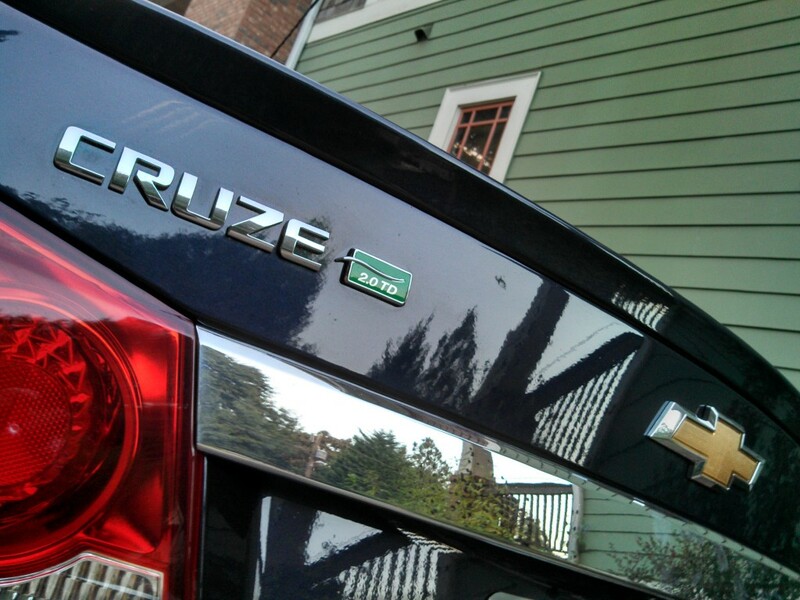 The gas-engine Cruze and the Cruze Diesel drive a bit differently. The diesel engine reveals its power and torque advantages almost regardless of engine or vehicle speed. The four-cylinder diesel delivers 151 horsepower and 264 lb-ft torque. Compared to the gas car, that’s 13 more horsepower and more than twice the torque. Standard equipment for the 2014 Chevy Cruze Diesel includes leather, a power driver seat, heated front seats, touchscreen infotainment, Bluetooth, remote start, power side mirrors and 17-inch aluminum wheels. The test car includes another $2,400 in options. Among them are navigation, upgraded audio, a backup camera and a safety package with blind spot monitors, rear parking sensors and rear cross traffic alert. The test car’s total price including destination is $28,120.